With its mix of beaches and upgraded facilities, Durban is challenging Cape Town as the South African event location, writes Abigail Wills. Is Durban South Africa's new contender for international conferences? Durban is predicted to be the fastest-growing tourism city in Africa this year and one of the fastest-growing tourism destinations in the world, according to research by credit card firm Mastercard. It projected 33 per cent growth in the number of international visitors in 2012. And, since the Durban KwaZulu-Natal Convention Bureau (Durban KZN CVB) was formed, just two years ago, it has also seen the number of business travellers increase. 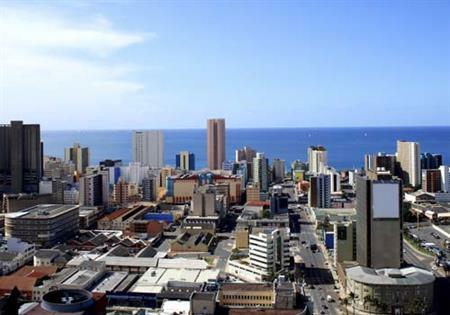 The convention bureau has been instrumental in ensuring that Durban improved its ICCA ranking by 50 points to 178 in 2010 and by a further six points to 172 in 2011. Staging COP17, the world's largest sustainable energy conference, in December 2011, was a highlight of the past year, and Durban Exhibition Centre had a £1m upgrade in the build-up. Other recent developments include the opening of the African Sky at The Coastlands on Umhlanga Ridge Hotel. "It has by far the best view," says Durban KZN CVB chief executive James Seymour. "The Olive Convention Centre is about to be expanded to cater for up to 2,500 delegates and the Moses Mabhida Stadium has a great new meeting venue that can cater for up to 400 delegates. The remainder of Durban's beachfront is undergoing a major facelift, in the same manner as the beachfront area from the Moses Mabhida stadium to Ushaka Marine World did in the build-up to the 2010 Soccer World Cup," he adds. In the past 24 months, the convention bureau has worked in collaboration with partners including the International Convention Centre (ICC) Durban to secure 29 professional association events over the coming years. These range from the 2012 International Wildlife Management Congress to the Rotary International Congress, which is expected to attract 20,000 delegates in 2019. The events are expected to generate in excess of £100m and generate more than 8,000 jobs. Association Event Planner spoke to three of these congress organisers to get their views on Durban and its CVB. Nick Phillips, chairman of the host organising committee of the Rotary International Congress in Durban, says the organisation has been mounting major conventions, sometimes with attendances in excess of 45,000 delegates, in most of the world's major cities for more than 100 years; it is extremely professional in everything it does and so had exacting standards when it came to selecting the venue for its 2019 congress. "Many people worked tirelessly to ensure that the bid conditions were met and that the inspection team were able to access all the areas and information that they required. Key to the bid process was the Durban KZN Convention Bureau headed by James Seymour. "I think it is accurate to say that, without the convention bureau, we would not have been able to satisfy the inspection team of our capability to mount this convention. The bureau is a vital link in any large convention planning and execution process and Durban can be very proud to have such a facility." Giuliana Martini, director of Phambali African Events and project manager on behalf of the South African Department of Environmental Affairs, was tasked with organising the Climate Change Response Expo that ran alongside COP17. "COP17 attracted about 15,000 delegates, and it worked very well because Durban is quite centralised in terms of the accommodation, break-out rooms and meeting rooms for a conference of this nature. "Durban has a very mature, up-to-date infrastructure. The exchange rate is an advantage because you get much more for your dollar, euro or pound than you would anywhere else in the world. "What could perhaps make it better would be more international flights direct to Durban airport. The only other negative is the humidity in January and February, which is quite high. "But there is a beach that you can use 12 months of the year, fantastic golf, wildlife, spas and the historic Boer War sites all within a two-hour drive. Durban is a long-haul destination, so always keep that in mind when drawing up an itinerary. I would suggest including a twoor three-day preor post-tour. "The CEO of the CVB is one of the most passionate and knowledgeable people in the convention industry in South Africa. He understands that every convention delegate has a knock-on effect on the economy. He will open all the local infrastructure doors for you and nothing is impossible." Darryl Walter, director of membership marketing and conferences at The Wildlife Society, staged the fourth International Wildlife Management Congress, in July, at the ICC Durban, where it welcomed 400 attendees. "The congress has previously been held in Costa Rica, Budapest and New Zealand but, due to financial constraints, had not taken place for the last nine years. "We were looking for a local organiser to partner with and received contact from the ICC Durban, which had approached the Wildlife and Environmental Society of South Africa, to see if it would be interested in co-hosting the conference. "In just 18 months, we came to agreements with them in terms of the set-up of the congress, the objectives and the theme. Durban ICC helped facilitate that relationship, and the people at the ICC, the hotels and our PCO, the Conference Company, were a pleasure to work with. "When you think of South Africa as a destination you think of Cape Town first but I would encourage planners to look at Durban. I think you could get a more competitive arrangement." Walter adds: "The CVB provided a financial incentive for us to have the congress in Durban and in all honesty that made a huge difference. The subvention all but covered the space rental at the ICC and the catering, and the convention bureau also helped with marketing messages to promote the congress. "As a wildlife congress, it is important that there were wildlife viewing opportunities, which of course there are in South Africa. The city also has a new airport - King Shaka International Airport. You have to go through Johannesburg but there are a good number of connecting flights. "We didn't have a single problem with safety or security but it would be better, in my opinion, if the two or three blocks between the ICC and beachfront were cleaned up so that they were more friendly and people felt it was safer to walk."